Despite the distribution of long-lasting insecticide-treated bednets (LLINs) throughout Cameroon in May 2016, 32% of pregnant women do not sleep under LLINs. In the Far North region of the country, epicenter of the disease, 77% of pregnant women do not use LLINs. These are some of the key results of the second edition of the “Shadow Report” published in July 2016 by a local watchdog organization in Cameroon, For Impacts in Social Health (FIS). FIS has been working for over two decades in Cameroon to eradicate injustice in the field of health, and to improve the health of vulnerable populations. Since 2012, FIS has been working on issues of aid effectiveness in the health sector, primarily targeting the Global Fund. During that time, FIS has mobilized a network of over 80 community-based organizations and media – including television, radio, and print – to monitor the efficiency and effectiveness of Global Fund grants in Cameroon, which represent over 40% of total aid in the health sector. These field workers are called “community watchdogs.” They work on a voluntary basis, but FIS provides them with a small stipend to offset transportation and communication fees (mostly to book appointments with health care personnel). Both the program and the reports it produces are called “Shadow Report(s).” The Shadow Report is an alternative assessment of the official reports on how well the principal recipients (PRs) are performing. The shadow report is based on surveys which assess the availability of services and the degree of satisfaction of the communities that benefit from the Global Fund grants. The Shadow Reports also help to identify priorities for improving access to services and the management of the grants, and they provide specific recommendations. The findings and recommendations are discussed with the PR. The intent is that the Shadow Reports will be published quarterly, although there was a gap of over six months between the first edition, published in November 2015, and this second edition, to allow for some training to take place. 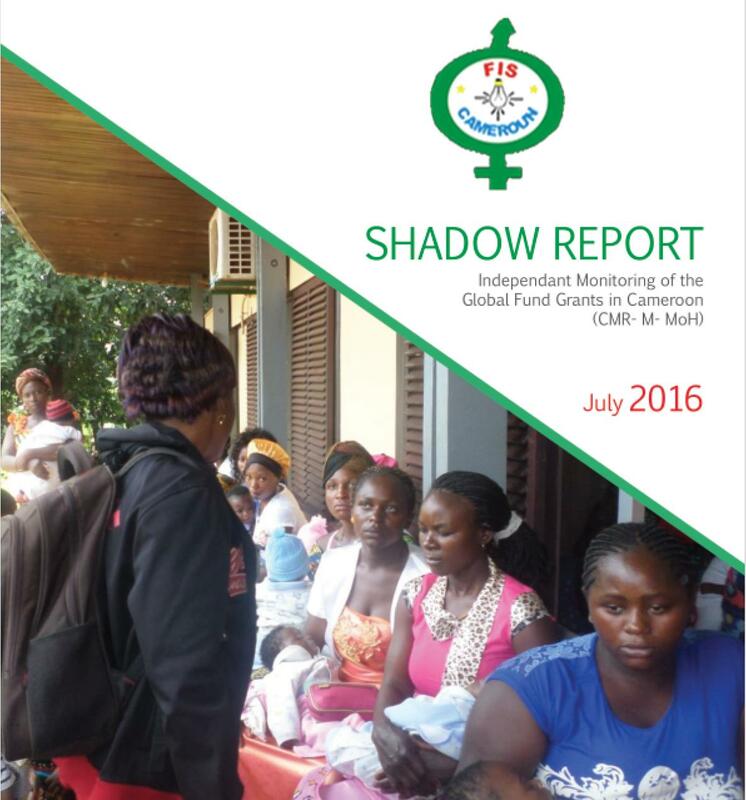 The second edition of the Shadow Report focused on Cameroon’s malaria grant (CMR-M-MoH). Six key performance indicators were monitored and about 3,000 families were interviewed. The research found some encouraging results, such as 88% of surveyed households actually received LLINs (compared with just 66% in a 2013 survey); and 83% of households surveyed slept under LLINS. But, as indicated above, the results for pregnant women were not at all encouraging. Although the entire population of Cameroon is at risk of contracting malaria, pregnant women and children under five are identified as the most vulnerable. The main reasons for the under-utilization of health services by women of reproductive age in both rural and urban areas are: (a) lack of autonomy in decision-making; (b) self-medication; and (c) the practice of consulting traditional healers, which arises from false beliefs about antenatal care. Remove gender inequalities in order address the barriers women face accessing services. Strengthen the community response to improve the treatment of uncomplicated malaria at home in a context where the remoteness of health facilities is a major obstacle to accessing care. The first edition of the Shadow Report dealt with TB grant. Its recommendations focused on strengthening the community involvement strategy. This edition had an impressive distribution among local media. This led to the National TB Program providing a letter of support to a local organization that was applying for a Stop TB grants to strengthen the community response. The Advocacy Officer at FIS, Ms Jessie Fernanda, told GFO that “we have benefited from the support of Aidspan’s ‘Local Mentorship Program’.” Aidspan has been providing support to local organizations in Africa to get involved in the monitoring of the performance of Global Fund grants at country level. As far as we know, FIS is the only organization in Africa producing these kind of shadow reports. Editor’s note: Bertrand Kampoer, GFO’s correspondent in West and Central Africa, is also the Executive Director of FIS.